The best dog urine remover has the ability to keep your home fresh and clean with no unpleasant smells. The urine removers are particularly useful while the potty training stage is still taking place. Unlike your everyday cleaning products, the dog urine remover is created with a specific formula to effectively remove the stains left by pets. The most effective products include active ingredients that fight the actual bacteria found in pet urine. However, it is important to be very careful when it comes to buying the cleaning products for use in homes with dogs. It is best to avoid the general purpose cleaners and instead go with the purpose-made solutions that are safe to use in the local dog’s environment. Dog urine remover products are typically made with all-natural ingredients to ensure they are safe for your four-legged friend. Why do you need the purpose-made urine cleaner? 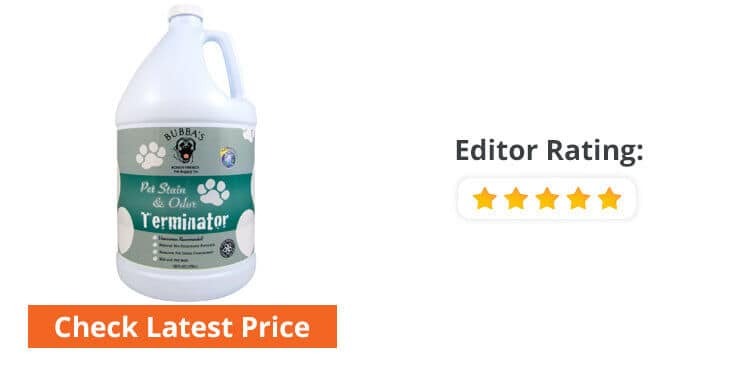 The top-rated dog urine removers listed below have the ability to offer the most complete job to eliminate pet urine odor and stains in the home. They are practical for use on a wide range of surfaces including the carpet and items of furniture like the sofa. Not all pet urine smell removers are the same, so make sure to check its ingredients and intended use to ensure it is a practical choice for your specific situation. In the process of identifying the best pet odor eliminator in the market, we analyzed countless products and checked consumer reviews, active ingredients, and features. Trust this to work, the Rocco & Roxie Professional Strength Stain & Odor Eliminator is created to not only remove the stains but also penetrate deep into the carpet to eliminate the odor deep down. This #1 best seller has the ability to attack many different organic spills, include pet vomit, feces, and urine. 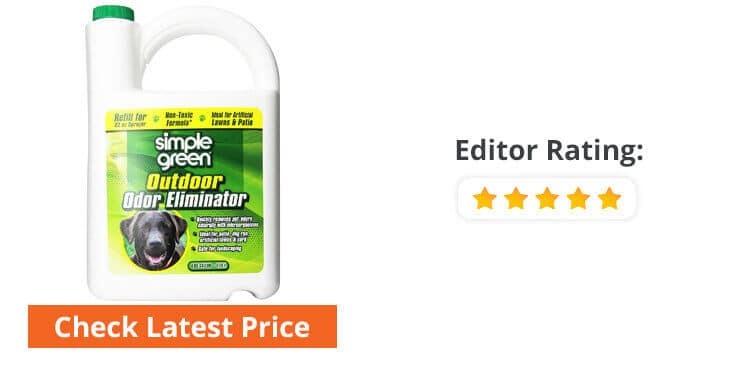 This spray is rich in natural enzymatic bacteria to quickly destroy all signs of stains and odors by feeding on the organic matter and ammonia crystals until fully removed. The Rocco & Roxie is entirely safe to use in the presence of pets and children. It is a certified solution that is color safe and chlorine free. Use this product on virtually any surface from the carriers and kennels to litter boxes and clothing to furniture and carpeting. Great for young or elderly dogs, the BUBBAS Enzyme Pet Odor Eliminator is your quick and efficient solution to eliminate urine from many different surfaces, including hardwood floors, rugs, and carpets. The active ingredients in this solution have the ability to act on and remove the urine smell and stains that most everyday carpet cleaners are unable to work on. This pet odor eliminator has a scientifically proven formula to take care of all unpleasant messes in the home. The organic and natural ingredients are deep penetrating to give a permanent solution for cleaning. Plus, it is rich in enzymes to give the most effective type of stain destroyer. Beyond its ability to clean pet related messes, this active solution is also helpful for treating grass stains and laundry spot treatment. 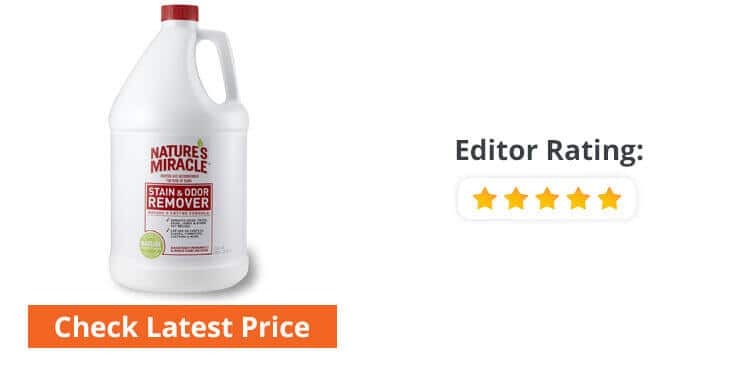 Great deep penetrating action, the Orange Oxy Stain & Odor Remover by Nature’s Miracle is a reliable option for pet owners in search of a quick solution to eliminate pet feces, urine, and general dirt. It is made with a special dual-cleaning action that is super-oxygenated and able to target the specific odors and stains on the carpet. This Nature’s Miracle product is most effective when used to attack pet stains and odors in carpets, carriers, kennels, clothing and hard surfaces. It is entirely safe to use in homes with small children and pets. Also, this cleaning solution has the ability to lift the old and embedded stains with a little care and attention. 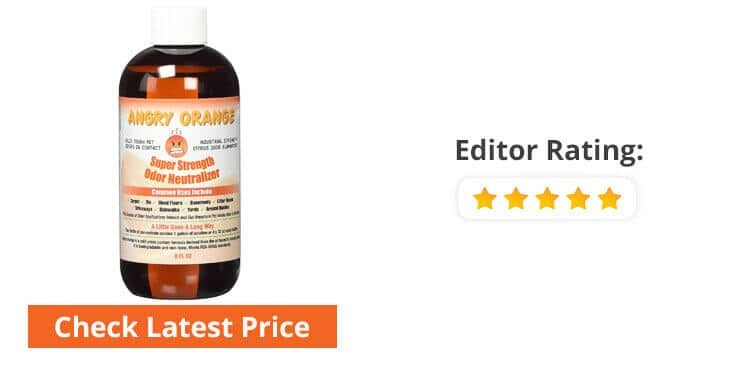 The Orange Oxy range leaves behind a pleasant fresh orange scent and this pet smell urine remover is really effective at tackling odors and not simply to mask the smell. 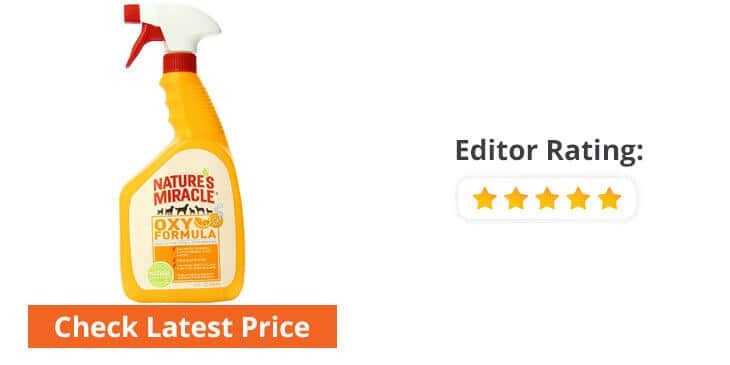 Fast and effective, this Pet Stain and Odor Remover by Bubba’s is a natural solution to eliminate the stinky pet odor from upholstery, rugs, floors, and carpet. It is a practical solution for working on the old or new stains and is highly effective at penetrating deep into the carpet or upholstery. This animal odor eliminator is a type of enzyme cleaner that is guaranteed to get the job done and eliminates anything left behind by your pet. 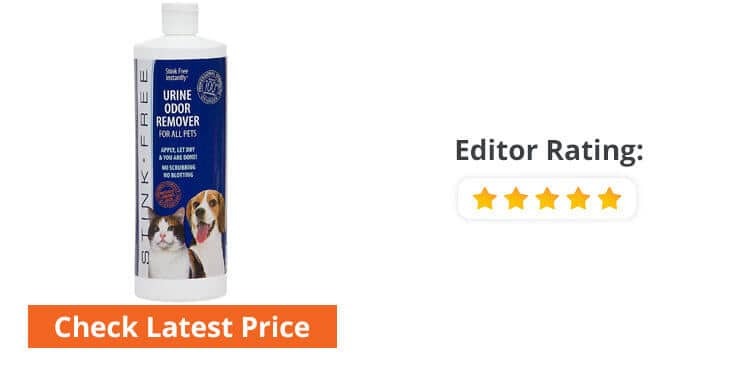 Use this dog pee stain remover on urine, vomit, and feces for the most promising results. Although, it can also be used to treat furniture, interactive dog toys, crates, cages, kennels, and the dog bed. The active ingredient includes dormant bacteria that attack the stains and odors to fully eliminate and not to simply block it. Triple strength action, the Pet Stain, and Odor Remover by Particular Paws get to work immediately to destroy the bacteria and gases in pet urine. The triple action relies on stain fighting bacteria and bio-enzymes to act fast to completely revive the soiled carpeting or furniture. 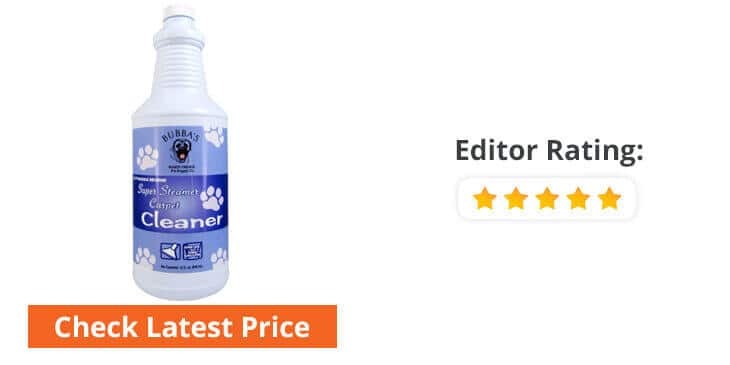 This pet stain and odor remover are most effective on pet urine, vomit, and feces. Also, it can work on the old and new stains, so even if you have had a persist stain that couldn’t be removed by other means, this triple action formula is certain to be worth a try. The active micro-bacteria in this product will fully destroy the waste to leave the carpet clean and fresh. Also, the ability to completely remove the odor means the dog is less likely to return to a particular spot in the home. The environmentally friendly formula is chemical free and practical to use in the family home. The Urine Odor Remover by Stink Free is a top quality and safe product to use in the home to target pet urine and stains. The cleaner has a pleasant perfume smell that isn’t too overwhelming. It is really easy to use – simply pour the solution on the stain and leave it to dry into the carpet or soft furnishing. There is no need to scrub the surface because the active ingredients will completely eliminate the stains and odor in a relatively short time-frame. Any bad smell oxidizes out for the most effective treatment. A great benefit of this treatment is the ability to remove the odor for the long-term and will not return once the odor remover has evaporated. Great enzyme solution, the Super Steamer Carpet Cleaner by Bubba’s is a great all-round cleaning product for the home. It is really useful for attacking the pee odors created by our pets and practical to apply to rugs, upholstery, and carpets. 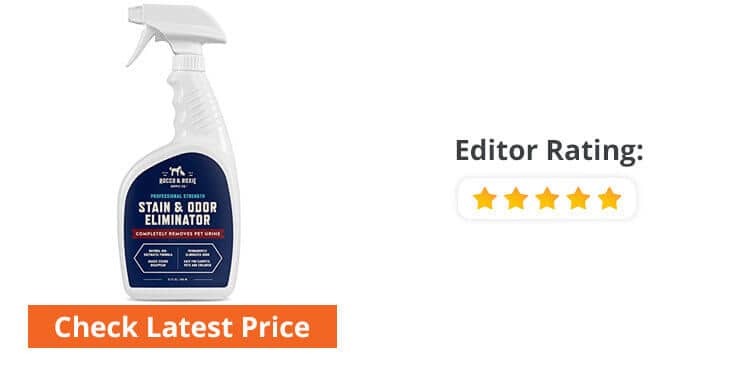 This is one of the best odor remover options and intended to be used with any brand of carpet shampooer (Hoover, Bissell, or others). This is a deep penetrating solution that will target and revitalize carpet fibers while also helping to improve the quality of the indoor air. A regular cleaning with this product should help prolong the usable and attractive life of the carpets throughout the home. Plus, this solution can even restore the texture and color of the carpet. Works great, the Outdoor Pet Odor Eliminator by Simple Green is intended to be used on artificial lawns and patio areas. The active ingredients are entirely safe and non-toxic to make it safe to use around small children and pets. 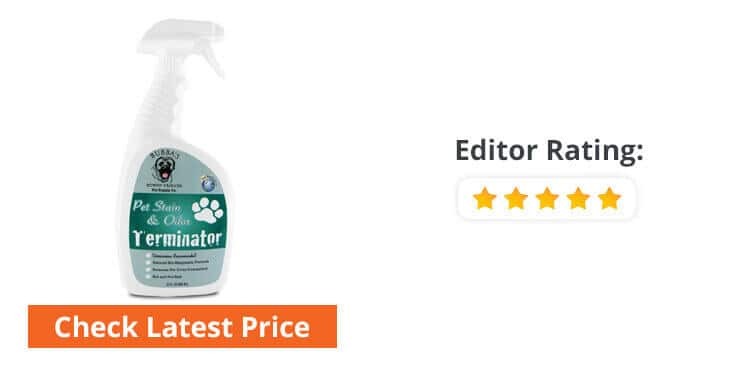 The pet odor eliminator is designed to be very easy to use and is simply a process of carefully pouring the solution into an appropriate size garden sprayer. The natural ingredients are rich in microorganisms to quickly remove pet odors in a quick and friendly way. The Stain & Odor Remover by Nature’s Miracle is created to quickly eliminate vomit, drool, feces, urine, and other pet mess. This stain remover is practical for most areas of the home such as clothing, furniture, floors, and carpets. It is a fast acting and permanent remedy to make sure the stains and odors are removed for the long-term. In addition to working on the recent stains, this solution can also help to take control of the deep-set and old stains that other products were not able to handle. Also, it is worth noting the formula for this product has recently seen an update and now has a strong smell that is very noticeable when in use. Neutralize tough pet odors fast, the Pet Odor Eliminator by Angry Orange is an industrial strength solution to remove pet stains and odor. This product is made with non-toxic and biodegradable ingredients to make it completely safe to use in the home with small children and pets. Its main natural ingredient is oil sourced from orange peels. This not only gives a highly effective formula for removing all signs of pet stains and odor but also gives the clean fresh smell. This odor eliminator is very versatile and practical for the carpet, hardwood floors, or the orthopedic dog bed in the home, as well as concrete and general yard space. A great positive is the need to only use a small amount of the spray solution per application, which means a single 32oz bottle has the potential to go a long way. The preferred type of cleaner is certain to relate to the intended use. Is the carpet cleaning for pet urine, soft furnishings, hard floor surfaces, or elsewhere in the home or garden? So, make sure to identify the most frequent use and buy the cleaner to match that particular purpose. In order to eliminate all signs of odor and stains, go with a super strength pet urine odor remover formula that is made with the intention of targeting pet mess. The purpose-made solutions are the most effective at getting rid of the foul smell throughout the home. Bog urine remover has enzymes as part of the active ingredients to quickly destroy the proteins in the urine that can attract a dog. The solution must have the ability to eradicate 100% of the smell in the home. Many of the regular cleaners will simply mask the odor, which has no real long-term benefit. A solution that contains ammonia can smell quite similar to the odor of urine, which leads to the dog returning to this spot and seeing it as a toilet. Use the chemical free solution that is safe in homes with small children. The all-natural ingredients can be just as effective at eliminating the stains and odors in the carpets and soft furnishing. Also, there is less risk of contaminating the dog dry food, the grooming brush, or collars. The most effective pet cleaners have the ability to eliminate the old and tough stains and odors. They should have a deep cleaning action to leave the carpet or soft furnishing highly deodorized and holds a clean, fresh scent. Most of the best pet odor eliminator products aren’t too expensive, but it is still worth shopping around to get the very best prices. There are plenty of different types and brands, so make sure to do your research and pick one that matches the specific needs. For the best results, go with a high quality and reputable brand that is respected in the industry. Also, make sure the chosen product is free of harmful chemicals and practical for homes with small children and pets. It is also important to bathe your dog regular basis that means 1 or 2 times in a week or when it gets dirty and spread bad smell. While bathing you have a use a good shampoo and if your dog’s skin is sensitive then you must choose shampoo comfortable with sensitive skin. 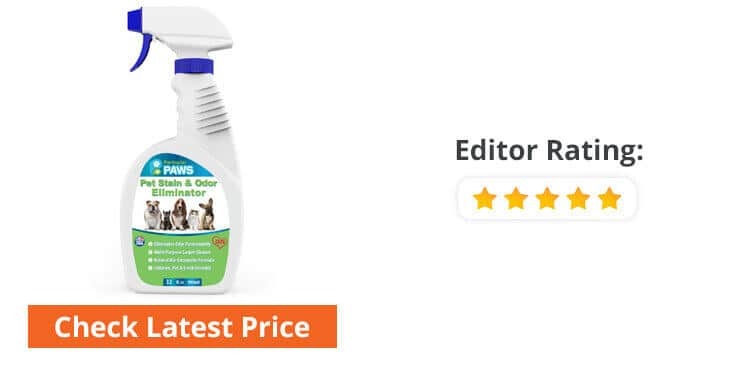 With the best dog urine remover at your disposal, you shouldn’t have too much difficulty in controlling the unwanted stains or odors left behind by your pets. The right cleaning solution is certain to mean the task of eliminating difficult messes and stains is that much easier. Our list of the top rated products should make the process of finding the right cleaning solution for the specific needs a more straightforward process. By investing in one of the high-quality urine removers mentioned above, you are certain to get cleaner, fresher home in no time.